To increase your sales, do the right internet advertisement! The dark horse of advertising industry in 2014: Mobile ads and Rich Media ads have growth rate up to 70%. At the end of 2013, still thinking about how to rapidly expand your sales? The answer is: Website ads! After reading the following data, you will probably know where to put your ads and attract your target audiences! 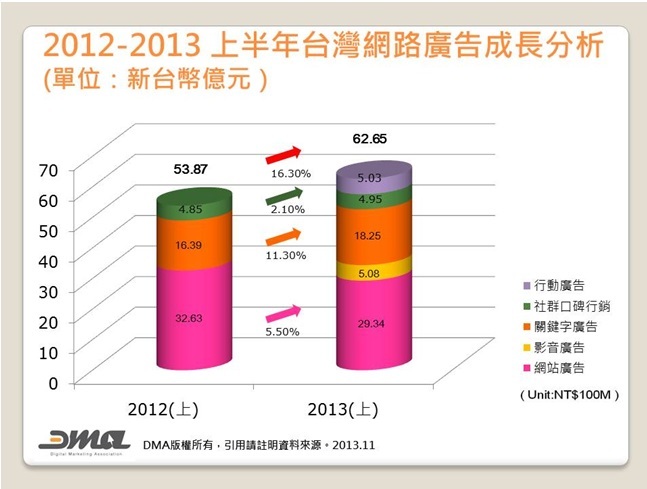 Taipei Digital Marketing Association (DMA) officially delivers their prediction about growth rate of digital advertising market in first-half year of 2013 and the growth rate in whole year’s scale. 1. Make use of multiple ads, seize the internet market. According to DMA’s research data, Taiwan's overall digital advertising market reached revenues of 6.265 billion NT dollars in the first-half year of 2013. Among them, website ads accounted for 46.8% as reaching revenues of 2.934 billion NT dollars. Rich media ads accounted for 8.1% and gained revenues of 508million NT dollars. Keyword ads gained 1.825 billion NT dollars, accounting for 29.1%. WOMs(bloggers) reached 495 million, accounting for 7.9%. And mobile ads reached 503 million NT dollars, accounting for 8%. From here you can evaluate which type of internet ads your business has not tried yet. We can see the accounting rate of rich media ads rise rapidly this year. Although those video ads are as short as 5 seconds, this type of ads still became the dark horse in 2013 because of the frequent use of mobile video platform by teenagers. 2. Mobile ads grow rapidly, catching your audiences in 5 seconds. Mr. Yang, the chairman of the association, indicated that the revenues of all types of digital ads are growing in the first-half of 2013 comparing to previous year, especially rich media ads and mobile ads. You can feel the heat in the market while many brands started to deliver their ads to mobile users, particularly in the game industry. Despite it is app, mobile ad, FB Community ad, or YouTube video ad, all types of ads have entered the market from different aspects. When people are gathering the mobile channel, those owners of ads must also keep their pace. It is not only about making mobile ads, but also where to place them and when to show them to your potential customers. You have to seize the key 15 seconds to attract the customer. And sometimes it is even less than 5 seconds. DMA predicts that the overall growth of digital advertisement market in 2013 will be 138.73 billion dollars, accounting for 19.51% approximately. All types of digital ads are expected to grow, with video ads and mobile ads accounting for more than 70%. Keyword ads and WOMs (bloggers) steady grow with growth rate estimated to be 10%-15%. Although there was a downward trend in the investment of display ads, they are still widely used because that many media companies have introduced precise delivery tools to enhance advertising effectiveness. Here are some statistics about Taiwan's Internet advertising revenues in the first- half year of 2013.